President Donald Trump’s approval rating has sunk to a new low as enthusiasm among his base continues to ebb, a new Morning Consult/POLITICO survey shows. Slightly more than 4 in 10 (42 percent) registered voters said they approved of Trump, while half said they disapproved. 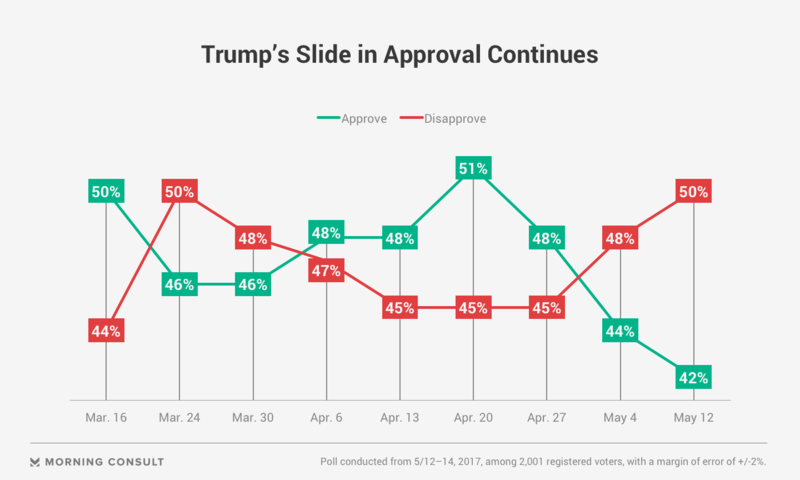 The approval number was at a new low for the second successive week while the share of voters who disapprove of his job performance is at its highest since the House GOP’s botched effort in March to pass their bill to overhaul Obamacare. Eight points underwater, it’s also his lowest net approval rating since taking office. Perhaps more worrying for the president — and for Republican members of Congress ahead of the 2018 midterm elections — is a declining strength in support among the voters who elected him. While 84 percent of Trump voters still say they approve of the president’s work, the share of those voters who strongly approve of him is down to 42 percent, another new low. In the previous poll, 49 percent of Trump voters strongly approved of him. The foundering came as Trump’s firing of Federal Bureau of Investigation Director James Comey continued to play out on news cycles across the country. The share of voters who heard about the Comey dismissal increased from 74 percent in the middle of last week to 81 percent over the weekend. As voters hear more about the firing, sentiment on the subject is moving away from Trump. In the days immediately following the firing, 35 percent of registered voters said Trump was right to remove Comey as FBI director and 33 percent said he should have let him stay on. But over the weekend, 40 percent of voters said Trump should have let Comey continue, while 34 percent still stuck with the president’s decision. The swing largely came from Democrats and independents. More than one-third (36 percent) of independents now say Trump should have allowed Comey to stay on, compared with 28 percent who shared that sentiment last week. Democratic opposition to the move grew from 58 percent to 65 percent. Slightly more Republicans (14 percent vs. 10 percent) said Trump was wrong to remove Comey, although the same share (62 percent) still said he was right. A plurality of voters (42 percent) also now say Trump’s firing of Comey was inappropriate, compared with 34 percent who said that last week. The share of voters who said it was appropriate was down 2 points, from 37 percent to 35 percent, during the same time frame. The circumstances of Comey’s ouster, which the president admitted in an NBC News interview came, in part, because of the agency’s ongoing investigation into potential collusion between Trump campaign associates and Russian intelligence officials, also appears to be piquing the interest of the public in terms of priorities for Congress. Asked to list their top priorities for Congress, 37 percent of voters said the legislative body’s top priority should be investigating Trump campaign officials for alleged connections or contacts with the Kremlin during the 2016 elections — the same share of voters who listed repealing and replacing Obamacare or reforming entitlement programs such as Medicare and Social Security. Slightly fewer voters listed passing tax reform (35 percent) or clearing an infrastructure spending bill (32 percent), and one of Trump’s signature issues, constructing a U.S.-Mexico border wall, was a top priority for just 19 percent of voters. 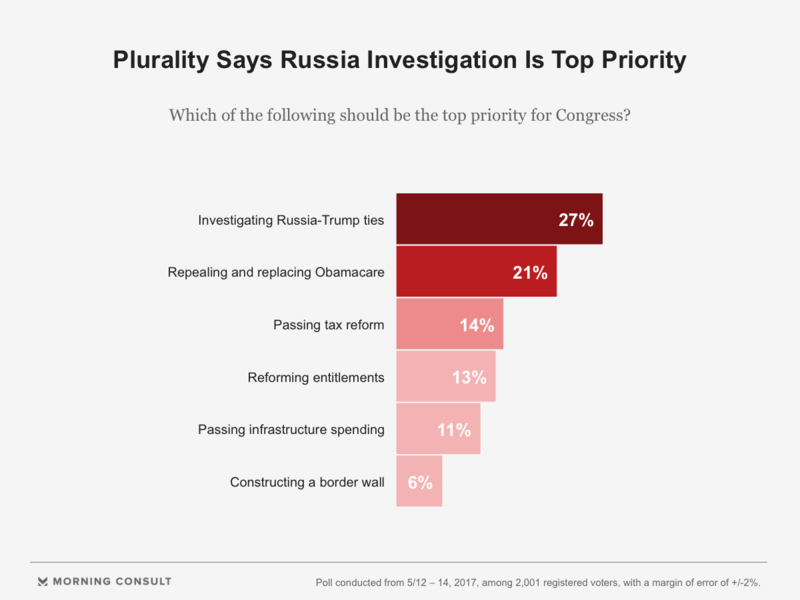 When asked to pick just one of those, a plurality of voters said Congress should prioritize the Russian investigation, followed by 21 percent who opted for health care reform, 14 percent for tax reform, 13 percent for entitlement reform, 11 percent for infrastructure policy and 6 percent for the wall. Both Democrats (49 percent) and independents (22 percent) said the Russian investigation should be at the top of lawmakers’ to-do lists, compared with 6 percent of GOP voters, who favored an Obamacare overhaul (37 percent) and then tax reform (18 percent) as their top priorities. The national, online survey polled 2,001 registered voters May 12-14 and has a margin of error of plus or minus 2 percentage points. See the full results here.